The 2018 San Francisco Decorator Showcase runs through on May 28. It is the first showhouse held in the historic Marina District. A Spanish Mediterranean home designed and built by architect George McCrea in 1930, it features spectacular views of the Bay, Golden Gate Bridge, Alcatraz and Marina Green. While the designers created magic on the interiors, painter A.J. Oishi's Delaunay-esque art installation graced the exterior. The colorful house represents the 41st annual San Francisco Decorator Showcase. Designer Nan Rosenblat launched it as a fundraising vehicle for the then four-year-old University High School’s financial aid program. For the first showhouse, UHS found a Willis Polk estate built in 1912 on Pacific Avenue. Showcase became a way to celebrate San Francisco’s architecturally significant residences while highlighting both new and established designers. Over the years many of Coupar's clients have participated in Showcase creating exquisite rooms. Paul Vincent Wiseman of The Wiseman Group did his first showhouse in 1983, going on to produce many other beautiful spaces. In 1996, he addressed the Living Room of the Baldocchi Sea Cliff Villa built in 1924. The Mediterranean style home designed by Earle Baldwin Bertz accentuated panoramic views of the Golden Gate Bridge, Pacific Ocean, and Marin Headlands through arched bay and picture windows. Wiseman and his team complemented the vistas with a layered salon of period antiques, contemporary art, and a sepia color palette. Kendall Wilkinson also mixed old with new in her Master Suite for the 2007 Showcase. Located in a four-story Italian Renaissance-style Palazzo above the San Francisco Bay at Broadway and Baker, architect Henry Clay Smith built it in 1927. With a bold teal blue color scheme complemented by coral Chinoiserie toile, Wilkinson made the focal point of the room a tree of life mural. Against this, she installed a shaped acrylic headboard. Wilkinson flanked the bed with white lacquer parson styled tables. A serpentine Louis XV walnut commode and gilded Rococo mirror act as counterpoint. Melanie Coddington of Coddington Design eschewed antiques in favor of mid-century classics for her guest suite of the 2014 San Francisco Decorator Showcase. The 1906 estate built for Rose and Alfred Sutro by the architectural team of Bliss & Faville boasts beautiful views of the Presidio and San Francisco Bay. Coddington reflected the calm with a tranquil color palette of mercurial blue and silvery beige. Luxurious details of nailheads, contrast welting, custom bedding, textures and statement fabrics and the finishing touches to the bespoke space. 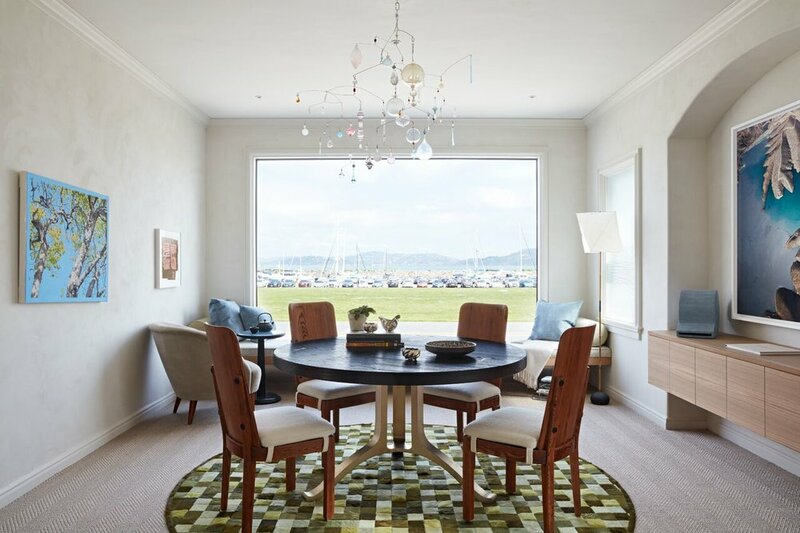 David Bjørngaard of Bjørn Design also selected contemporary furnishings for his Art Salon Dining Room in the 2018 San Francisco Decorator Showcase. Taking a cue from the views of the Bay, Golden Gate Bridge, Alcatraz and Marina Green, he employed a color scheme of sand, driftwood, sage, and sky. The room focuses on artwork from the alumni of the Headlands Center for the Arts Program. A mobile by Julie Condon of hand blown glass, gemstones, and crystals strung together with stainless steel wire resembles sea glass. It is an unexpected substitute for a chandelier. Coupar looks forward to seeing the exquisite and unexpected in the 2019 San Francisco Decorator Showcase.